Please click on the above image to view a larger, clearer image in a new window. The graph shows, upstream counts per day between 1st Feb 2018 and 31st Jan 2019. Also shown is flow at Knapp Mill gauging weir (blue line) and water temperature (red line). 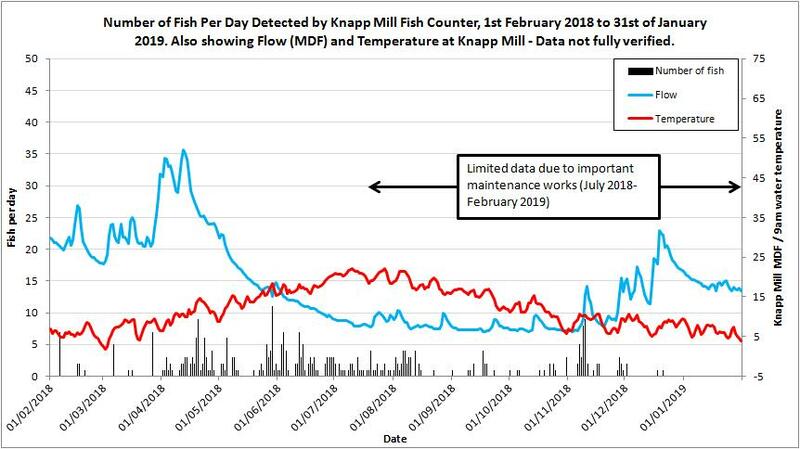 The data on the graph relates to fish detected by the counter (Salmon and Sea Trout) and is not an overall estimate of the population at this stage as it does not account for upstream and downstream fish which are not detected by the counter.